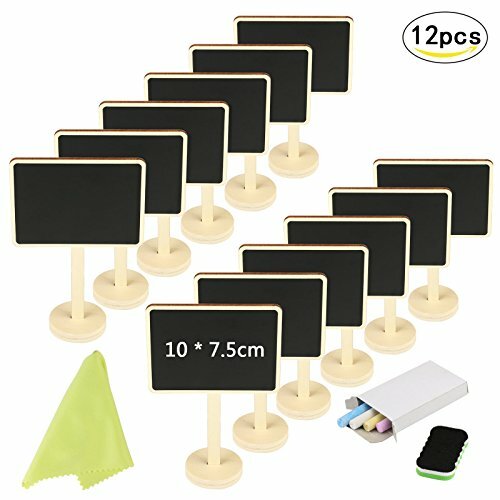 12 Pcs Chalkboards Sign - The package is come with 12 pcs decorative chalkboard with stand,a box colorful chalk(4 pcs,random color),a erase and cleaning cloth.It perfect for tabletop decorative sign as well as kids DIY craft. Tablbetop Decoration - Wood rectangle small chalkboard signs are ideal place on table for your wedding,birthday party,banquet,baby and bride shower,Children \'s Lolly Parties or other specil event,add a rustic feeling to your decoration,adorable and elegant. Multipurpose - You can place these mini chalkboards in kitchen,office,store,cafe or other place to show your message for parties table number,place cards,food name card,plant decorative sign and so on. Message Board - It not only can be used for leave messages to your beloved family and friends on the mini blackboard instead of a paper,as well as can be writing important memos on the chalkboards as a reminder in home or office. Reusable - These mini chalkboards are made of wood,sturdy and stable.You can write on it directly with chalk,with a erase and cleaning cloth, the text can be wiped away easily,also it can be reusable.